There are probably a million (or, at least 10 that I can think of off the top of my head) variations of the Patty Melt, and now, all hail the Patty Melt Pizza. So simple, so obvious, and yes so good. I used one half of the recipe of Cheri's Favorite Pizza Dough. It turned out great, and has become my favorite pizza dough recipe to date. The other half was used for the incredible Pepperoni Pizza Rolls. Preheat oven to 500°. While the oven is heating shape your dough into desired shape. Poke several small holes in the crust with a fork to prevent bubbling. Brush pizza dough with extra-virgin olive oil. Transfer pizza dough to whatever, pan, stone, etc you will be using for cooking. Cook pizza dough without toppings for 5 minutes once the oven is preheated. Cook beef or bison over medium heat in a skillet, add garlic, and break it into small pieces with a spatula. When cooked through, drain any grease, set aside. In the same pan add extra-virgin olive oil, once hot add onion rings and cook for three minutes. 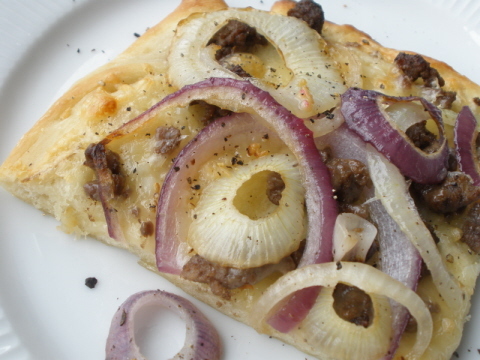 Layer toppings on partially cooked pizza dough: ground beef, or bison, cheese, then onions arranged how you like them. Cook pizza with toppings for 10 minutes more, or until golden brown and cheese has melted. Don't have your fill of pizza ideas? Get all 21 weeks worth here.